You love your iPhone. We do too!. You carry with you all the time and it’s a part of your life. That’s why we’ve tried to make it better. Introducing: One Tap! One Tap! is an application that is completely different from what you’ve seen up until now. With One Tap! you will be able to communicate with your friends and contacts faster than ever in a totally different way from how you’ve been doing it until now. 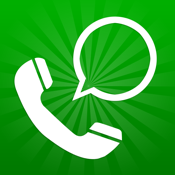 Type in the phone number of the person that you want to call and the app will present you with all of the contact information. Tap a button and choose how to communicate with him or her. Think of the name of that person and type their name or a few letters in the numeric keypad and One Tap! will show you the people that coincide with who you want to call. One more touch and you will be able to send texts, iMessages, e-mails or call him or her from inside the app. Quick searches, contacts, call records, favorites - One Tap! is all that and much more! It’s an application designed to make your life easier. Do you have any doubts about how to use the application? Any problems? Do you have an idea that you would like us to carry out? Don’t hesitate and contact us through any of our forms of contact. We would love to hear from you.